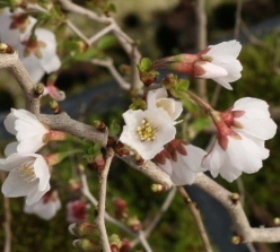 Prunus incisa, or the Fuji cherry, grows naturally as its name suggests on the slopes of Mount Fuji in Japan. This cultivar retains all the hardiness of its parent, with the added attraction of dark, twisted stems and a shrubby growth habit. This compactness means that it can be grown (and looks at perfectly at home) in a container, or on a rock garden, making it ideal for gardeners whose spring would not be complete without a flowering cherry tree but who do not have the space for a full-size cultivar. It needs little or no pruning, except to restrict its growth if necessary, and does not need an acid soil, although it does best if the soil is not too free-draining. The shrub does well and looks at its best in dappled sun and shade, where the white-pink blossom shows to best advantage. No garden should be without its spring blossom and good autumn colour.